The market share of North Korean cigarette manufacturers has been increasing because North Korean cigarette factories have turned their gaze on domestic low-priced brands instead of counterfeit products. According to the statistics of the Korean International Trade Association, since 2000 imports of Chinese cigarettes have increased every year and in 2003, reached a maximum of 9.4 million dollars. Since the early 1990s, North Korea has felt keenly the necessity of earning foreign currency after suffering the aftereffects of the collapse of socialism in Eastern Europe. Accordingly, North Korean authorities have had an interest in producing and trading drugs and counterfeit cigarettes that need a low initial investment and quickly convert into money. 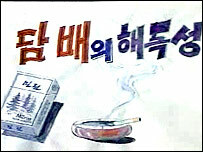 Since 1992, North Korea has mass produced imitations of Mild Seven, Crown, 555, Dunhill and other international brands. When suffering the “March of Tribulation” in the late 1990s, middle managers started taking an interest in counterfeit cigarette markets, which had been occupied by the authorities. In Nampo, Pyongsung, Pyongyang and other big cities, with the appearance of counterfeit cigarettes made by individuals, competition between the national cigarette traders and private manufacturers in the jangmadang started. Workers of cigarette factories kept secretly packing papers of the counterfeit cigarettes and sold them to the private manufacturers. The North Korean authorities eventually took measures to punish the private manufacturers, to confiscate their products and search the workers’ bodies one by one. However, after printers were allowed to be used in some factories related to IT departments of universities in 2002, managers of printers being in collusion with private manufacturers started printing the packing papers of cigarettes. After the start of the 2000s, North Korean authorities turned their gaze on domestic demand for cigarettes. The biggest North Korean cigarette factory is Ryongsung Cigarette Factory, where most counterfeit cigarettes made by North Korea were produced. As sales increased since 1997, the No. 39 Department of the Workers’ Party, which operates, accumulates and manages Kim Jong Il’s slush funds, has been directly operating the factory. The top quality counterfeit cigarette in North Korea, CRAVEN “A,” so called “Cat cigarette” by North Koreans, are produced in the factory. The past price of CRAVEN “A” was much more expensive than Chinese cigarettes, such as Hongmei, BAT, Zhangbaishan and Tianping, being equivalent to two kilograms of rice. However, among cadres and the wealthy they were excessively popular. At the time, Chinese brands of cigarette in North Korea were generally valued at around the price of one kilogram of rice. With profits increasing since 2003, North Korean authorities have tried to increase production by re-opening ruined factories that had closed their doors for lack of resources during the March of Tribulation. In 2002, “Rasun” and “Sunbong,” which were produced in cooperation with Chinese entrepreneurs, came out in the Rajin-Sunbong area at a lower price than Chinese cigarettes. Meanwhile, some of private manufacturers who went under in the competition have disappeared from the cigarette market or been merged with big factories. About a century ago, in the early 1900s, no major political movement could rival the Marxists in their commitment to gender equality. It was the time when women could not vote anywhere (well, anywhere apart from New Zealand and Australia), when their property rights were strictly limited, married unemployment was seen as the most natural state for “weaker vessels”, and most professions were not for women. In those days, the early Communists vocally demanded equal political and economic rights, equal pay, and also insisted that women should be given access to all professions, including the most manly ones. When the Communists took power, for a brief while they tried to keep their promise. In the Communist Russia of the 1920s there were highly publicized cases of female air force pilots, military officers, and ambassadors. However, this drive did not last: Communism in power proved to be very patriarchal, and by the 1940s the earlier demands for gender equality were quietly scaled down in all Communist states. Of all these states, North Korea probably proved to be most patriarchal, especially after its turn to nationalism in the late 1950s. Nationalism often goes hand in hand with anti-feminist sentiments, and North Korea was no exception. Soon North Korean women learned that they should know their proper place (of “wise mothers and kind wives”, of course) and be careful about their behavior, least it threaten public decency and morality. This “proper” behavior was enforced through a number of restrictions: certain types of activity were denied women. North Korea has its own version of the “glass ceiling”, not allowing women to rise above a certain level. However, there are also bans on some mundane daily activities which for some reason are proclaimed to be “unbecoming of women”. To start with, women are not allowed to smoke. In North Korea, female smoking is an absolute taboo, at least for young and middle-aged women. Female smokers in the South are disapproved of, but in the North the approach to the transgression is much tougher. As one defector put it: “A North Korean woman must be crazy to take up smoking”. There have been reports about women being sent into exile for their persistence with the smoking habit. I am slightly skeptical about these reports, but it is clear that in smoking a woman risks some serious “criticism” during an ideological study session, and this is not a good turn of events in North Korean society. This is in stark contrast with males’ behavior, since most North Korean males are chain smokers. However, older women are exempted from this ban, and there are many North Korean women who begin smoking when they turn 50 or soon afterwards. Pyongyang, the “capital of revolution” is somewhat notorious for many bans of seemingly normal things which are declared improper and unbecoming. Some of these bans are gender specific. For example, in Pyongyang and other major cities, for a long time women were not allowed to wear trousers. It was OK to work in trousers, but once the shift was over, decent North Korean women were supposed to dress in a “womanly manner” – that is, to change into a skirt. Those who appeared on the street dressed in trousers could be sent home by a police patrol. Once again, the ban did not apply to older women, and in the mid-90s trousers were partially pardoned. In general, “proper female modesty” has always been extolled. In 1982 Kim Il-sung, while addressing the North Korean rubber-stamping parliament issued a warning: “It does not conform with the socialist lifestyle if women wear dresses without sleeves or a dress that shows their breasts!” North Koreans tried to ensure that the skirts were of an appropriate length to “conform to the socialist lifestyle”. Even nowadays, in the days of relative openness, skirts should safely cover the knees of the wearers. Driving is not regarded as an activity suitable for a woman, and women are never issued a driving license. Of course, the number of private cars is very small, and their owners are naturally overwhelmingly male. It is remarkable that in the past, back in the 1970s and 1980s, even foreign women could encounter difficulties if they applied for a driving permit in Pyongyang. Obviously, North Korean officials could not comprehend how the female brain would be able to master such a technology. However, the most bizarre of all these bans is one which deals with cycling. Bicycles were prohibited in Pyongyang for decades, and the ban was lifted only around 1992. However, this relaxation was not for everybody. In 1996, authorities decided that the bicycle was not suitable for women. The official press explained that “beautiful national customs” do not permit such debauchery. Allegedly, this judgment was the decree of Kim Jong-il himself. At first, police worked hard to enforce the ban, and some female riders had their bikes confiscated, but then things cooled down and some women began to defy the prohibition. However, it is increasingly clear that these and other bans are enforced by police with ever diminishing zeal. The North Korean dictatorship is running out of steam, not least because its own servants do not believe the official slogans anymore. North Korean civilians’ average life span was disclosed to be approximately 14-years lower than the average life span in South Korea. The Ministry of Health and Welfare said through inspection documents of the administration on “North Korea’s Health and Medical Situation,” which was recently submitted to the National Assembly. According to this document, the North Korean civilians’ average life span is 61.4 years for males and 67.3 for females, an average of 64.3 years. For South Korea, the average is 78.1 years, with 74.4 for males and 81.8 for females. The significant difference in average life span for North and South Korea reflects the fact that the severely worsened medical environment in North Korea. According to the document, North Korean teenage boys’ smoking rate is supposed to be at an extremely alarming level. In the case of 16-year old males, the smoking rate is around 59.9%. This exceeds by 20.7% the smoking rate of South Korea high school students, provided by the Korean Association of Smoking and Health. Cigarettes in North Korea, in contrast to South Korean cigarettes, contain a very high level of tar and nicotine content as well as higher toxicity, due to the fact that cigarettes lack filters or are hand-made. The document also revealed that 32~40% of North Korea’s 20~34 year olds show signs of malnutrition and approximately 34~36% of them are anemic patients. These results can be attributed to North Korea’s continuous food shortage situation; disease rates due to malnutrition and anemic are high. North Korea’s birth rate is 1.94, higher than South Korea’s 1.19. However, the infant mortality rate, between `99~`02, was 23.5 per 1,000 persons, but conversely, the `06 mortality rate was 42 persons, 14 times higher than South Korea’s (at 3 persons). The health span (a period without sickness or handicap) is 52.3 years old (based on 2000 data), a significant decrease from South Korea’s 67.8 years (in 2005). The reason why North Korea’s health and medical situation is so tenuous as shown above is due to the lack of the state’s investment in this area. The actual situation is that there is an unmistakable gap between North Korea’s single dollar payment for a person’s health and medical fee and South Korea’s $625. Further, in North Korea, it is extremely difficult to obtain basic medical goods, such as cold medicine or antibiotics. The Ministry of Health and Welfare plans to invest 294 million won (approx. USD316,120) to modernize the People’s Hospital in Gosung and Songdo in Kaesung next year, besides continuing medical support for North Korea. I’ve met a number of former North Korean merchants, and today I would like to tell the story of one such woman. The story is typical in many respects, and I suspect that countless thousands of her peers would narrate something similar. When the Dear Leader died in 1994 and things began to fall apart, Ms. Yoo was in her early 20s, doing semi-skilled work at one of the offices in the North Korean capital. By autumn 1996, even in privileged Pyongyang, food rations were coming less and less frequently. Ms. Yoo’s office, like many other offices across the country, decided to shrink its workforce. Every month all workers were given one week free, on the assumption they would somehow fend for themselves. They were not paid that week’s wages, and did not receive rations either. Essentially, it was Ms. Yoo’s mother who was the brains and energy behind the entire enterprise. A kindergarten teacher, she was a typical Korean “ajumma” at her entrepreneurial best: charismatic, charming when necessary, clever andquick-witted. Actually, Ms. Yoo did not know much about her mother’s contacts and plans. Now, a decade later, she still remains ignorant. However, one thing was clear: the mother had good connections among the personnel of the hard currency shops. How did she manage to acquire such connections? After all, the hard currency shops are staffed with privileged people, while a kindergarten teacher is not very high in the North Korean pecking order. We know not. At any rate, these connections existed and this fact sealed the fate of Ms. Yoo. It was not what people would talk about so much, but Ms. Yoo believes that many of her colleagues started private trade in those years, when it began to flourish. She was no exception, but her situation was better since her mother would take care of business planning. Ms. Yoo’s mother chose cigarettes as their major merchandise. The smuggled Chinese cigarettes sold extremely well, the packs were light and so could be easily moved by the girl in her early 20s, and profits were very high. In late 1996 a pack of ten would cost 280 won in the borderland areas, but could be sold in Pyongyang for 400 won wholesale. Later, Ms. Yoo found ways to buy the cigarettes even cheaper, at 240 won a pack, purchasing the merchandise directly from the smugglers instead of the local go-betweens. Mother sold the cigarettes to the hard currency shop. It is not clear what happened to the merchandise eventually. It seems that the shop managers simply pocketed the money they received from the sales of the cigarettes. A single trip would garner a net profit of some 20,000 won, and she could go once a month (sometimes more frequently). Now consider that Ms.Yoo’s official salary was 80 won a month, and her father, a junior college teacher, received something like 150 won a month, so the black market money from the cigarettes ostensibly appears an outrageously large amount of money. However, in the world of the Pyongyang black market, which began to emerge around that time, this was not seen as a fortune. Still, Ms. Yoo spent no more than 1,000 won a month on herself buying whatever was her fancy. One of her more extravagant splurges was on a South Korean cosmetics set which cost 800 won, or roughly her official annual salary. At the time she did not quite realize where the goods were produced, since being a good, politically correct girl, she still believed that South Korea was populated by beggars living in constant terror of the sadistic Yankees! But what about travel permits? After all, for decades no North Korean was allowed to leave the county without a permit issued by the police. Well, by the mid-1990s the travel permit system was in disarray with a single exception: entrance to Pyongyang remained strictly controlled. However, in most cases money talked, and permits could be issued for a moderate bribe. However, Ms. Yoo and her mother discovered an even easier way. They did not bribe officials but bribed railway policemen, those who were on duty on the North Korean passenger trains. For 500-1,000 won, plus free booze and some presents, a policeman would make sure that Ms. Yoo would reach her destination and come back with sacks of cigarettes, and he also would take care of her personal security. Better still, the 500-1,000 won bribe was sufficient for few round-trip commercial expeditions. The trips were hard. The carriages were unbelievably crowded, with people packed everywhere, sitting on roofs and ladders. As Ms.
Yoo describes, “even on the roof one could not see a square centimeter of paint, people there were sitting that tight.” Another problem was the frequent delays, so the journey of some 400-500 kilometers would normally take 2-3 days. Still, the money was good, and Ms. Yoo enjoyed the adventure, and even now, ten years later, she seems to be proud of her ability strike deals, calculate profits and losses, and find suppliers. However, Ms. Yoo’s business activity did not last for long. Somewhat against her will, she found herself lured (or kidnapped) to China and soon fate turned in a way which made a return home impossible. The North Korean capital, Pyongyang, has reportedly become the latest city to impose a smoking ban. However, rather than being for the good of the general public, it is all about the country’s leader Kim Jong-il. The move comes after doctors advised Mr Kim to stop smoking and drinking after a recent heart operation, reports say. “Kim’s home, office and all other places he goes to have been designated as non-smoking areas,” a former South Korean lawmaker said. “A Chinese diplomat who has close relations with the North Koreans told me by telephone that doctors had asked Chairman Kim Jong-il to quit smoking and drinking,” Jang Sung-Min, an associate of former South Korean president Kim Dae-Jung, told the French news agency AFP. “Even the highest-ranking officials are going outdoors to smoke,” he said. Mr Kim, 65, has reduced his official activities this year, and a month-long disappearance from public view in May prompted rumours of failing health. A team of German doctors visited Pyongyang in May, sparking speculation among some foreign and local news media that Mr Kim might have had a heart operation. This has never been confirmed. While accurate information is hard to obtain, several accounts portray Mr Kim as a former chain-smoker and a heavy drinker with an appetite for fine dining. Such rumours are hard to confirm because of the highly secretive nature of his regime. The North Korean jangmadang’s (market) rice price has narrowly increased after the spring shortage season. As a result of DailyNK’s investigation of price levels in Northern cities of North Korea at the end of June and beginning of July, the price of North Korean rice is 900 won per kilogram which has increased 80 won compared to its price at the end of March. At the jangmadang in Shinuiju, North Pyongan, the price of rice, compared to three months ago, has been sold at a 120 won higher price at 980 won. North Korea’s spring shortage season is around March to May before the barley harvest, after the passage of spring. The reason why the price of rice has shown a narrow upward tendency of 100 won domestically is that along with the effects of the spring shortage season, the nationwide “farm supporting combat” was implemented last May. During the farm supporting period, the jangmadang was closed out, so it became difficult to obtain rice. Further, with the delay in South Korea’s support of 40,000 tons of rice to North Korea, the increase in the price of rice seems to have been fueled. The price of South Korean rice, compared to the end of March, increased over 150 won. South Korean rice was sold at the increased price of 1,100 in the Shinuiju region. Along with the increase in the price of rice, the exchange rate seems to show a slight increase as well. In Hoiryeong, it increased by 50 won, compared to the end of March, according to the basis of 3,100 won per dollar. The Chinese Yuan was sold at a 390 won line, having increased 20 won. Besides this, the staple of North Korea’s lower-class, corn, compared to the end of March, increased by approximately 80 won to 450 won per kilogram. With the rise in the price of rice, the demand for corn as a substitute ration seems to have increased as a result. Frozen pollack, which cost 4,000 won per one, went down to 3,500 won. Chinese-made shoes, compared to March, is being sold for 7,000 won per pair, having decreased around 5,000 won. In addition, the price of Chinese industrial products as a whole is showing a decline. 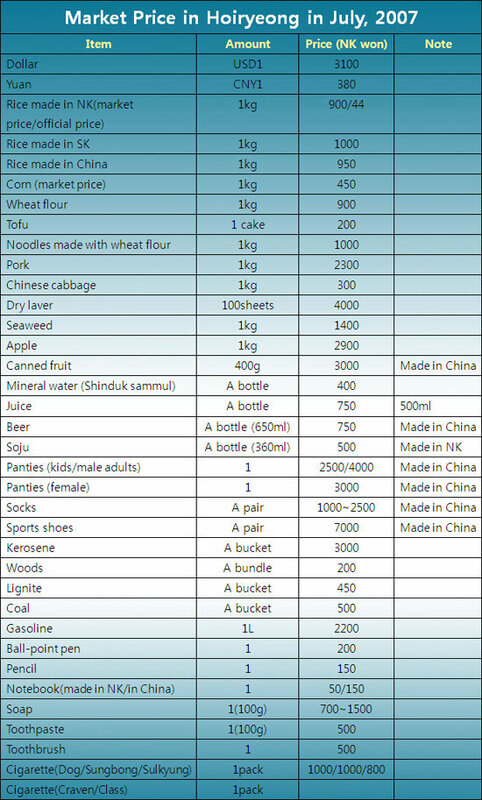 Due to North Korean merchants who received goods through Korean-Chinese peddlers in the past going over to China themselves and obtaining goods through dumping, the drop in prices has been continuing. Pork (2,300 won per kg) or cabbage (300 won per kg) and the price of other vegetables, compared to the end of March, declined by 200 won. In the case of fruits, the price of apples skyrocketed by 1,400 won from three months ago to 2,900 won per kilogram. Also, among North Korean cigarettes, a product with the brand “Dog” recently surfaced. The price is the same as “Sunbong” at 1,000 won. The representative foreign brand “Craven (called ‘Cat’ in North Korea)” narrowly declined to 1,300 won. The results of a general survey of market prices in the northern region of North Korea carried out by the “Daily NK” show that grain prices continue to rise. The survey, taken from the end of June to the beginning of July, showed that the price per kilogram of domestic rice was 900 Won, 80 Won higher than at the end of March. Sinuiju market prices have risen 120 Won over the last three months, with rice now selling for 980 Won per kilogram. The ‘lean season’ in North Korea runs from the spring and lasts 3 to 5 months into the summer until barley crops are ready for harvesting. The rise in rice costs by around 100 Won appears to be due to a combination of factors, one being the influence of the lean season, and another being the mobilization of city residents to farming communities to help with harvesting. During harvesting season, markets are closed as workers are sent to the fields, making it difficult to purchase rice. In addition, the decision by Seoul to delay delivery of 400 thousand tons of aid has further aggravated the situation. The price of South Korean rice in the North has also risen, up 150 Won since March in some areas, and up as much as 250 Won in Sinuiju, where a kilogram of ROK rice sells for 1,100. The rising cost of rice is fueling demand for substitute grains, causing their prices to rise as well. Corn, a staple food for low-income DPRK families, has risen 80 Won since March, to now sell for 450 Won per kilogram. In addition to rising grain prices, currency exchange rates also appear to be on the rise. In the city of Hyeryung, one USD is worth 3,100 Won, 50 Won more than in March. The Chinese Yuan has risen 20 Won, and now trades for 390 Won. On the other hand, the prices of some goods in the markets are falling. In particular, Chinese goods are becoming more available, thus lowering costs. Chinese shoes have fallen to 7,000 Won, 5,000 Won less than the price in March. Previously, goods were brought into the country only through Chinese-Korean cross-border traders, but now North Korean vendors have direct access to Chinese goods being ‘dumped’ in the North, causing their prices to continue to decline. British American Tobacco is pulling out of North Korea, but insisted the move had nothing to do with political pressure. The world’s second largest cigarette group, whose brands include Lucky Strike, Kent and Dunhill, said it had agreed to sell its 60% share in Taesong BAT, its joint venture in Pyongyang with the Korea Sogyong Chonyonmul Trading Operation, a state-owned company. BAT is selling the stake to SUTL, a Singapore-based trading group that invests in business ventures in South East Asia. The price has not been agreed yet but will be small in relation to the group. The sale is expected to be completed later this year. Following Japan’s economic sanctions, North Koreans are finding it to difficult to splash out on luxury goods, an inside source informed on the 17th. Though only a minority of the rich are experiencing this hardship as the import of Japanese cigarettes and foods slowly come to a halt, it will be interesting to note what further repercussions will follow as a result of Japan’s sanctions. Seven was first introduced to North Korea in the mid-1980’s and has captivated tobacco preference of North Koreans ever since. As living standards deteriorate in North Korea Seven cigarettes have become a rare commodity for an average person to have today, though earlier in the 90’s, Seven was a luxury cigarette smoked by the majority of North Koreans. In particular, merchants who accumulated wealth through North Korea-China trade still prefer this brand to others. Unlike other popular luxuries, smoking is a habit which becomes easily addictive. Hence, a handful of North Korean elites who in the past commonly smoked Seven’s and acquired its taste are experiencing withdrawal symptoms today, due to Japan’s economic sanctions and consequent ban of Seven. Seven is a strong cigarette and though it sells well throughout the Japanese, it is not a preferred brand in South Korea. While Japan places export bans towards the North, conversely North Korean authorities are also regulating Japanese goods. For this reason, North Korean citizens are smoking these cigarettes in secret. As supply does not meet demand, the cost of Seven cigarettes has skyrocketed in the cities of Pyongyang and Nampo. Nowadays, a packet of Seven’s in Pyongyang sells at around 40 Yuan (11,000 North Korean won, US$3.6). This is 7~8 times more expensive than the common North Korean brand of cigarettes “Cat.” Considering that a kilogram of rice costs 800 North Korean won (US$0.26) and the average monthly salary of a worker 3,000~4,000won (US$0.98~1.3), the price of Seven’s is phenomenal. However, as supply continues to be depleted, rich merchants and powerful ministers face a difficult test. Furthermore, the rich and former Korean residents of Japan are unable to taste the flavors of popular Japanese foods that they have become accustomed to such as soy sauce, bean paste and instant noodles for a long time. In amongst the North Korean accounts that were frozen from Macao’s Banco Delta Bank (BDA) was joint funds from a British tobacco company which has been deemed difficult to recover. The U.K. Financial Times reported on the 18th that the $7mn of the $24mn in North Korea funds frozen in BDA accounts is from Korean trusts and banks of which half the funds is estimated to from a joint account by British American Tobacco (BAT) and a tobacco company trading by North Korea. In another sense, as reports suggest that “The U.S. Administration told North Korea $12mn of the $24mn frozen funds appears to be unrelated to North Korea’s illegal actions,” others are cautiously anticipating progress from the six party talks as North Korea’s legitimate funds are released. You are currently browsing the archives for the Tobacco category.